This isn't art, but it's about an art student. 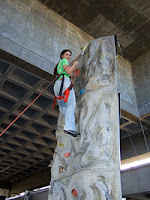 A climbing wall was erected in the middle of LMC as Nov 13 as part of a health fair the college hosted. Erica pretty much smacked down anyone who thought they could scale it faster than her. That's because art students are, well, the best.